“​This information is included in our Guide to Parenting in the Digital Age. Click here to see the rest of the guide. Almost any child that has access to a computer has equal access to the dangers of the Internet. Recent events in the news highlight these dangers. That’s why it is imperative that you be informed on how to protect your children when they’re online. Become computer literate and be actively involved in your children’s online experiences. Place computers in high-traffic areas, not a child’s room. Read unfamiliar e-mails. Monitor telephone and modem changes. Check out unfamiliar phone numbers and e-mail addresses. Don’t allow children to spend long periods of time on the computer, especially at night. Help children understand that online users may not be who they claim to be or who they seem to be. Get to know your children’s Internet friends. Tell children to report anything they come across online that seems strange or makes them uncomfortable especially if they are ever asked personal questions or invited to personal meetings. Tell children to report to you suggestive, obscene or threatening e-mail or bulletin board messages. Forward copies to your ISP (Internet Service Provider) and insist they help deal with the problem. Be concerned if children mention adults you don’t know, become sensitive, or appear to have inappropriate sexual knowledge. Post the Internet Safety Rules for Kids by your computer. ​Never give out personal information, such as your name, address, school name or address, or parents’ or teachers’ names or addresses. Never visit chat rooms or join an IRC (Internet Relay Chat) without permission. Never go to private chat rooms or meet online friends in a private online setting. Never go to new Web sites without permission. Never respond to rude or offensive e-mail, instant messages or postings. Never post, send or receive pictures (usually files that end with GI, jpg, jpeg, or tiff). Special thanks to a concerned and very helpful Parent for providing us with this important information. Marilyn Friend, Ph.D., has spent her career as a general education teacher, special education teacher, teacher educator, and staff developer. She is Professor Emerita of Education in the Department of Specialized Education Services at The University of North Carolina at Greensboro, and she is Past President of the Council for Exceptional Children (CEC), the largest international professional organization dedicated to improving the educational success of children and youth with disabilities and/or gifts and talents. Dr. Rhonda Bondie is an assistant professor of special education at Fordham University in New York City. She began her teaching career as an artist-in-residence and then became a special education teacher. She enjoyed over twenty years as both a teacher and administrator in K-12 urban public schools.Rhonda has been a faculty member at Harvard Graduate School of Education’s Project Zero Classroom for many years, where she has developed expertise in teaching for understanding, making thinking visible, and using protocols to build collaborative learning cultures. Rhonda’s innovative learning strategies have been published in books such as, Making Thinking Visible and Igniting Creativity in Gifted Learners , K-6: Strategies for Every Teacher and on websites such as the National History Education Clearinghouse. Michelle Lockwood, M.S., NJCIE’s Director of Positive Behavior Support Services, has over 17 years of professional experience working with students and individuals in need of behavioral support in public and private facilities. Prior to moving to New Jersey and joining the staff of NJCIE in 2007, Michelle was a Behavior Specialist and Inclusion Facilitator for the Howard County Public School System in Maryland. At present, she is working in multiple districts throughout New Jersey, providing professional development and support to school staff in developing school-wide, classroom, and individual student positive behavior support systems. Michelle also presents workshops to parent groups and facilitates the development of behavior intervention plans for individual students (elementary and secondary) based upon Functional Behavior Assessments (FBAs). When the World Loses Hope: How Can Teachers Help Students to Keep Pushing Forward? Understanding School Refusal & School Discipline Workshops. April 26, 2017. 9:45 A.M.- 2:45 P.M. in East Orange, Public Library. BMS Parent Academy – June 1, 2017 at 6 P.M.
DON’T MISS THIS TERRIFIC OPPORTUNITY TO LEARN MORE ABOUT YOUR CHILD’S LEARNING EXPERIENCE AND ALL THE ADVANTAGES ON OFFER – AT BLOOMFIELD MIDDLE SCHOOL! A Special Opportunity To See, Life, Animated,” an Oscar nominated film, Free showing in Glen Ridge. April 26, 2017 at 7 P.M.
Our friends at GRASE, (Glen Ridge Association for Special Education) have graciously extended a very special opportunity to Bloomfield SEPAC Members to see the film, “Life, Animated.” on April 26, 2017 at 7 P.M. in the Ridgewood Avenue Auditorium, 235 Ridgewood Avenue, Glen Ridge, NJ. Based upon the book by Ron Susskind, “Life, Animated” tells the story of a man who learns how he can communicate and speak with his autistic son. Please CLICK THE LINK IN THE FLYER BELOW to view the Trailer for the movie. Many thanks to The Glen Ridge Association for Special Education (GRASE) for their very kind invitation! “There are few better feelings than arriving at your chosen hotel for your vacation and sinking back into your bed, blissful and ready to relax. But for those on the autism spectrum, travelling is rarely calm — and more often than not, a source of stress. That’s one of the reasons why Cathy Lomond, owner of Hotel Port Aux Basques in Port Aux Basques, Nfld., decided to create a space where those with autism disorder spectrum (ADS) can feel at rest. Lomond’s sister, who has Down Syndrome, was a student of Chaisson’s when she was a child, and she believes that helped influence her decision to create a space that’s accessible to more people. Accommodations for those with ADS in the hotel include pictures secured to the wall in guest rooms, as well as hiding items like coffee makers using child-proof safety locks on dresser drawers (those with ASD can be sensitive to everyday sounds and textures, according to Autism Spectrum Australia). Additional door safety chains were also put in place out of reach of the children, as wandering is a common behaviour for people with autism. The lounge at Hotel Port Aux Basques for children with ASD. 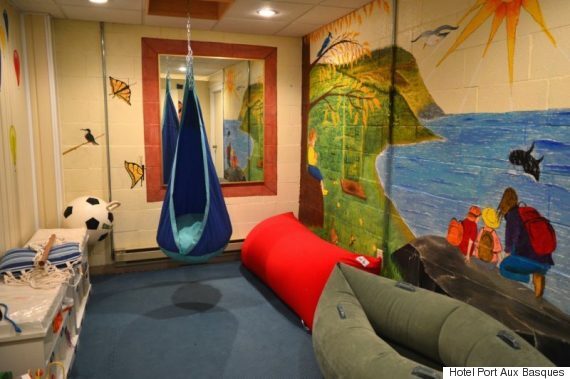 The hotel features a special lounge with a brightly painted mural, a swing, a climbing wall and a sensory boat to help engage children with autism in a comfortable environment. There’s also a kids’ menu available with pictures of the food items, which can help foster independence for children who may have trouble speaking. Staff were also trained to better work with those with ASD. “I wanted my staff to be able to help the customers travelling with an autistic person to understand the needs,” explains Lomond. Autism is the fastest growing and most commonly diagnosed neurological disorder in Canada, according to autism science organization Autism Speaks, but the specific needs of the illness aren’t necessarily understood, especially when it comes to design. According to the Children’s Hospital of Philadelphia’s Center for Autism Research, autism-friendly design can include anything from carpeted rooms (so as to reduce excessive sound) to dimmable lights (to give options for a variety of people on the spectrum). For children, the hospital also notes the importance of spaces like Hotel Port aux Basque’s lounge, an area kids can explore on their own while parents can watch safely from a distance. Lomond notes there are other activities available in the community for those with autism, particularly at the nearby Bruce II Sports Centre, where everything from swimming classes to preschool gyms can accommodate people with ASD, mostly thanks to the work of AIM and the tightknit community. Since keeping routine is noted as one of the most important ways to soothe people with ASD, and travel tends to be anything but routine, other services have begun offering autism-specific options on the road. The Vancouver airport, for example, launched the I CAN Fly program, which identifies passengers on the autism spectrum and helps facilitate smoother processing through customs and security screenings. Amusement park Canada’s Wonderland in Vaughan, Ont., meanwhile, offers a Boarding Pass Program, which allows those with mobility restrictions or ASD to better determine waiting times for rides, as well as which attractions they can comfortably enjoy.